I wasted a good paragraph questioning Covent Garden's programming. Surely the winter is a better time for fairy-tale carriages and hearths, sweeping tunes and dashing lovers. No one in July is in the mood for watching a nice, ordinary girl being swept off her feet by a prince. We'll lap this up round Christmas, cockles warmed, cynicism frozen, but otherwise marrying royalty isn't the aspirational thing it used to be in Britain; Who the hell wants to see Cinderella in summer? (Kate and Wills, Barnaby!) Oh, ok. Fair play, actually; that is some pretty nifty timing, Covent Garden. Pooling their resources with Barcelona, Brussels, and Lille, this production from Laurent Pelly arrives at the Royal Opera five years after it premièred in Santa Fe, and much has been said about how long it has taken Covent Garden to finally stage this 1899 work, but then the British have never quite got Massenet. Even Werther and Manon are more unusual to find than similar scored hits like La bohème or La traviata, and his Cendrillon doesn't get put on anywhere very often. It doesn't help that Rossini got there sooner with La Cenerentola (although that, likewise, always plays second fiddle to Il barbiere di Siviglia). Like Rossini's version, Cendrillon is written for high mezzo. In fact, Massenet has gone to town on mezzos here. Prince Charming is a mezzo trouser role (The 1979 studio recording unwisely rejigs the role for a decrepit Nicolai Gedda) and Cinderella's ghastly step-mother, Madame de la Haltière is written for a full on alto. So Cendrillon is ripe for our times for, although we can't find a decent Heldentenor or proper dramatic bass, we are knee-deep in good mezzos. Thirty years ago it was Fredrica von Stade, more recently Susan Graham and, for many, there will only be Cecilia Bartoli, but it seems that, for the foreseeable future, opera goers have decided that, amongst all the world's great mezzos, Joyce DiDonato is now the Best Thing Ever. And I think they are right. She's a veteran of both Rossini and Massenet's works (She had been in this production since the Santa Fe opening in 2006) and is vocally and physically ideal for the put upon dreamer. Gawky and wide eyed when cleaning, immensely fanciable in a party frock, she is a fine actress and wisely plays it fairly straight, creating a doleful foil to Pelly's gallery of grotesques. Her singing is exquisite, with that shimmering, chocolate timbre soaring over what can be quite heavy orchestration. 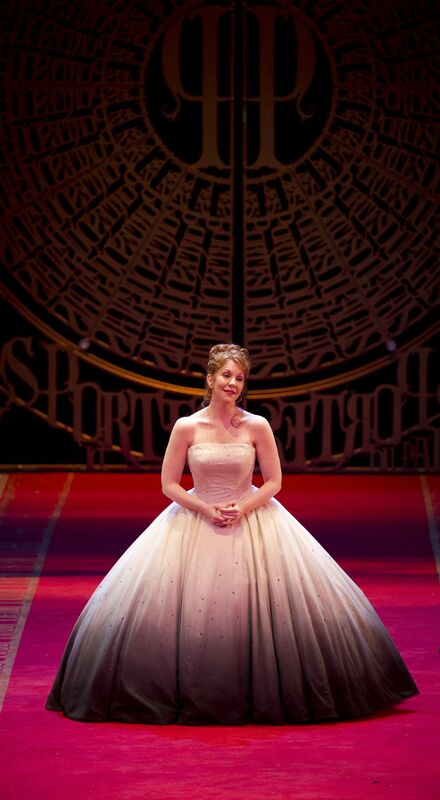 I have seen DiDonato lots of times and I have always been suitably impressed but this role really is a perfect fit. It was wise to cast Alice Coote as her prince. Another superb mezzo, her lovely, dark (almost alto sounding) voice contrasts well with DiDonato's lighter tone, making the love duets work very well. Coote and Pelly wisely play down the traditional princely virtues. Good natured and in love as he is, Coote's Prince is a defeatist, spineless little prig at times, head flopping in despair at the disastrous women he's forced to meet. This is probably more Pelly's creation than Massenet's but it fits a libretto than has surprising depth and wit. Unrecognisable in a brunette side parting, Coote highlights the part's decadence and vocally, like DiDonato, she bucks the trend of generalised, bland competence. These are voices that have soul, grit and expression. Diction from both was excellent. Mezzo number three was Eva Podles, a cult favourite for mad, domineering roles, with a voice dark, fruity and as butch as a truck driver's. As a social climbing step-mother from hell, Podles responded well to Pelly's cartoonish view of her and she was just hilarious in the final act, when crushing her husband's attempt to kick her out of the house. Matching her for hellishness were her two daughters (the stepsisters) Noémie and Dorothée. Taking notice of Massenet's twittery music, Pelly ditched the beauty spots and double chins, and had them played as brittly pretty sloanes. Given that by the end I wanted to ram this Hello Kitty pair's heads into a blender, I can therefore say that the performances of Kai Rüütel and Madeleine Pierard were an absolute triumph. Equally fine was Eglise Guterrez's batty but loveable fairy Godmother, making her weird, stratospherically high music make sense dramatically. With her dark, smoky middle range, but free and easy coloratura Gutierrez is an unusual singer but she sounded exactly right for the magical do-gooder. As Pandolfe, Jean-Philippe Lafont was sadly the weak spot in this ensemble. Despite a long, celebrated career on the continent, this was his Royal Opera début and I fear we caught him too late. Wobbly and hollow of tone, he made heavy weather of a lot of the music and only got a dramatic handle on the part later on after the ball. It is a potentially fabulous role to play and Lafont was very touching in his scenes with DiDonato, but this is not a part for a fading voice. Hopefully it was just an off night. Otherwise it was uniformly superb. Bertrand de Billy (seen in London far too infrequently) kept the ethereal score swiftly moving and allowed the gorgeous woodwind writing to shine, and this bright, clean textured view of Massenet seemed to match what was on stage. As one would expect from Laurent Pelly, this was a fun, camp, and often extremely funny production, which should bring out the worst from singers trying to be funny. Yet Pelly listens to the music, fitting the outrageous movements so expertly to this busy score, so that the line into unfunny, opera-comedy is never crossed. He also acknowledges that this is a modern, funny libretto, being often bitchy and snide, then charming you unawares with its soulful warmth. Likewise, the music is notable more for its culminative brilliance, rather than individual tunes. In fact, enchanting as the score is, there are no big tunes, like in Werther or La Cenerentola. What stick in the mind are whole scenes like Cinderella's entrance, sadly resigned to her lot, or that hilarious and touching Act 4 duet for her and her gormless but doting father, in many ways the best love duet in the piece. Despite the obvious draw of the title role, it is an ensemble piece, and with that one exception, I can't really see how Covent Garden could better the cast, so their inevitable DVD of this is a good idea, especially as there is only one (flawed) CD version to compete with. This is the first time I have seen Massenet's work but I genuinely think it superior to Rossini's amiable, flimsy score. There maybe no tune as big or as catchy as “Non più mesta”, but it is the general beauty and texture of the writing that sticks in the mind; silky and magical one moment, astringent and Offenbach-ian the next. The only complaint would be Massenet's (and Pelly's) rather gabbled, happy ending, sealing something that up until then has been bitchy, colorful, magical and funny. Pelly's production, nevertheless, is in complete sync to the score, and although I wouldn't call Cendrillon especially high brow, its sophistication and soulfulness belie Massenet's reputation as the maudlin, syrupy Puccini clone. Not many performances were scheduled but given how packed it was for DiDonato, this star vehicle will be back.